The Ancient Order of Hibernians are shocked and appalled that on St. Patrick’s Day, a day when America celebrates and honors the contributions that Irish Americans have made to our great country, the GOP would launch an attack on a prospective presidential candidate based solely on his Irish Heritage. Such a scurrilous, stereotype laced attack is more in keeping with the 19th century “Native American Party”, aka “The Know Nothings”, then the party of Lincoln who wept when he kissed a regimental flag of the Irish Brigade in honor of the sacrifice that so many sons of Erin had made in America’s Civil War. This offensive meme is nothing more than a 21st-century version of the scurrilous anti-Irish cartoons of Thomas Nast. As America’s oldest and largest Irish Catholic organization, founded in 1836 in response to anti-Irish bigotry, the Hibernians had hoped that the days when a candidate’s Irish ancestry would be used as a campaign fodder were confined to the dark past; that today American political debate focuses on the issues, not the ancestry of a candidate. Sadly, this toxic tweet from the GOP proves we were optimistic and premature in our beliefs. The Ancient Order of Hibernians suggests that those responsible for this exercise in prejudice for political ends read the President’s recent proclamation of Irish American Heritage month. 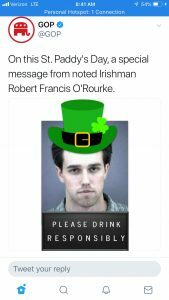 The Hibernians ask that the Republican National committee denounce this tweet defaming Irish Americans and their heritage, censure those responsible and offer a clear and unambiguous apology to the Irish American community.